What am I doing with such an assortment of stuffed pomelos? The first fat death star of a pomelo I got ten years ago from Samovar Tea for $65- a princely sum for tea back then. But my husband had a persistent cough and I read on the internet with some hope that these were a natural cure. Samovar Tea advertised the vintage as 1993 which could be up for debate. I also drunk a loose leaf puerh advertised on their menu as being "1950 Vintage Ancient and Amazing" at Samovar back in 2005- a story for another time. These pomelo skins were hollowed out, stuffed with steamed oolong and licorice and then charcoal fired to oblivion. It's pretty cheap grade oolong judging by the broken leaves and stems. Why would anyone use top grade leaf for something you're going to flavor and bake to death. The brewed tea leaves are carbonized jet black. I've read Hakka tea farmers in Taiwan commonly make this type tea for medicinal purposes but I'm suspecting the versions I have is bottom grade Wuyishan yancha. The Samovar version was misadvertised as being stuffed with puerh and it's definitely oolong. This tea did little to cure my husband's cough but it was tasty enough for me to search for more. Lightly smoky, the comforting citrus notes of this tea is just the thing to warm you up on cold rainy days. The next speciment I found was dated 2001 from Seven Cups but the tea proved still too astringent to drink even in 2006 which made me wonder if the Seven Cups version was either potentially younger than advertised or such pomelos require at least eight years to reach drinkability. The type of astringency is what I've often experienced with young roasted yancha. I would estimate the Samovar 1993 version was at least five years old when I got it in 2004 making it at least as old as 1999. Two pomelos were not enough to satiate me and I bought three more from Holy Mountain Tea. They are the youngest at 2003 and I have yet to even crack them open. Do you see the odd man out in the above photo? The gaudy hot pink wiggly ribbon should tell you there is something more exciting going on. I went on one last pomelo rampage in February of 2006 and got two puerh stuffed you zi cha(2002) from YS. 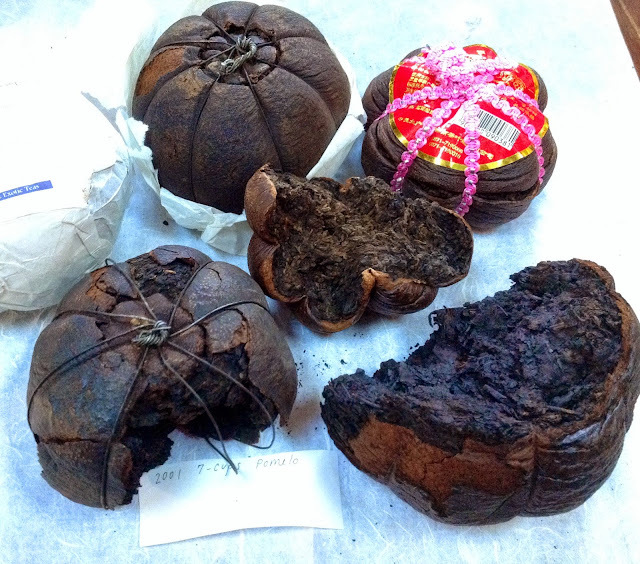 These appear not to be baked but sun dried and were advertised as being "Pomelo Sweated Puerh". The citrus taste can definitely overpower the gong ting loose shu. You can sometimes lighten and perk up other boring shu with tiny pieces of pomelo skin. I generally prefer my teas naked but a marriage of citrus and tea can be a fruitful one. If you are wondering, age appears not to make the tea any more wonderful. Being baked to death, there is no more transformation besides mellowing out. It may wrongly appear I drink a lot of this tea but in reality, I gave most of the missing chunks away. I hoard this tea mostly because of the lovely pomelo scent that relaxes me. It's too expensive to put out as potpourri so I bring out the storage boxes to sniff them from time to time. Alas I shall never taste one! :'( Unfortunately I'm on calcium channel blockers and this is one of those banned fruits that can triple the effect of such a medication, along with beloved grapefruit cousins. At least you an drink young sheng which is no small thing. I'd rather drink a vibrant young sheng than this pomelo. You can also get some of the same feeling from tangerine stuffed puerh. YS carries them I believe. Yes, I suppose that is true, though I have to space out the young teas to maybe once a week or so. The only citrus I can have, due to other medications, are oranges. Perhaps instead of the holiday clove-stuffed Orange I should do Orange Pu. I can hear the family enthusiasm already, "Mother's making the Xiaguan stuffing again."